This photo of Ryan Dungey was taken on May 22, 2008 before he rose to super-stardom. Back in 2008, Ryan Dungey had yet to win an AMA title. Back then Dungey wasn’t, well, the Ryan Dungey that he is today. He was an upstart Pro trying to solidify his placement at the top of the pecking order. With factory Suzuki backing and Roger DeCoster’s guidance, Ryan was advancing quickly. It’s fair to say that had he not suffered misfortune at Daytona in 2007 (Ryan failed to qualify for the main) and the following weekend in Orlando, Dungey could have won the 250 East that year. It would have been a rare feat for a rookie to win the Supercross title his first time out, a la Trey Canard. Fifth overall in the final point standings and three main event victories ensured that Dungey was going to challenge for the title in 2008. Roger DeCoster put Dungey in the 250 West series and Nico Izzi on the East in 2008. It was a smart move. The 250 West wasn’t as deep of a field as the 250 East. Dungey had to contend with Justin Brayton, Austin Stroupe, Broc Hepler, Jake Weimer and Brett Metcalfe. There was also a kid by the name of Jason Lawrence. Remember him? Ryan Dungey does. Lawrence and Dungey were polar opposites in every way. Ryan had a squeaky-clean image (he still does) while Jason was a boisterous wild child with a chip on his shoulder. Mind games ensued. No love was lost between the two. It appeared that Dungey would get the last laugh, because he stormed out to a 22-point gap after only three rounds. Jason Lawrence wasn’t even in the equation, as he was 34 points adrift. 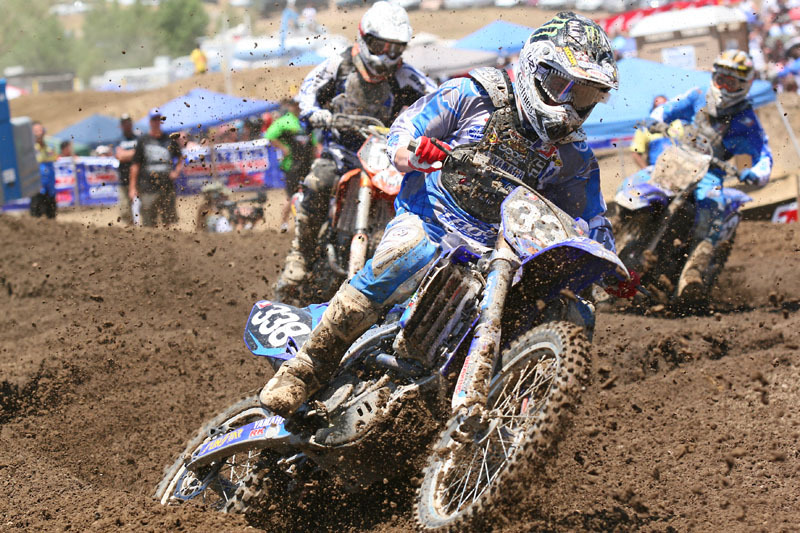 Remember this guy, Jason Lawrence, Ryan Dungey’s arch rival back in 2008. San Francisco was the turning point. Jason Lawrence used the rain to his advantage in powering away from the field. Meanwhile, Dungey suffered a poor start and could only manage seventh in the slop. The following weekend–the third and final stop in Anaheim Stadium–Ryan was slow out of the gate. In desperation he tried to make up lost ground, but came crashing down on an unsuspecting Wil Hahn over a triple. Both careened off the track. Ryan remounted, only to wash out his front end two turns later. These days Dungey is as cool as a cucumber, but at Anaheim 3 in 2008 he lost his mind. TO QUOTE AMERICAN POET EDWIN MARKHAM, “DEFEAT MAY SERVE AS WELL AS VICTORY TO SHAKE THE SOUL AND LET THE GLORY OUT.” TRIUMPH CAME A YEAR LATER WHEN RYAN DUNGEY CAPTURED THE 250 WEST AND 250 NATIONAL CHAMPIONSHIP. MAYBE RYAN KNEW VICTORY WOULD SOON BE HIS ON THAT SPRING DAY IN 2008, BUT HE DIDN’T SHOW IT. Of course, Dungey was probably seeing red when he looked up to find Jason Lawrence blowing out the candles for his second straight main event win. Ryan’s lead shrank to eight over J-Law. The following weekend in San Diego didn’t go any better for DeCoster’s protege. Dungey hit the deck twice and ended the night in sixth. As for Lawrence, he pulled another great start and went wire-to-wire for his third consecutive win. Jason took the points lead after San Diego, and extended the distance on Dungey in Houston when he finished second to Ryan’s fourth place (Austin Stroupe won). Jason Lawrence led by six points heading into the long break. The writing was on the wall. It would take a stroke of luck for Dungey to win the title. Instead Lady Luck beamed down on Jason Lawrence. Ryan won in Seattle, but Jason captured his one and only Supercross crown by bringing his Yamaha of Troy YZ250F home in second place. After the 2008 season, we met with Ryan Dungey and his agent at the time, Tony Gardea, at Competitive Edge for an article in MXA. Ryan put in a few hard motos in preparation for the 2008 AMA Nationals (he later finished second to Ryan Villopoto in the standings). Then we went to lunch. By his disposition and upbeat demeanor you would never imagine that he had just lost the Supercross title. Ryan was jovial and funny, but also very serious when the discussion turned to racing. He was more interested in what was to come than dredging up the past. To quote American poet Edwin Markham, “Defeat may serve as well as victory to shake the soul and let the glory out.” Triumph came a year later when Ryan Dungey captured the 250 West and 250 National Championship. Maybe Ryan knew victory would soon be his on that spring day in 2008, but he didn’t show it. Dungey was a winner and had nearly summited the highest peak of 250 racing. He wasn’t pompous or cocky (unlike his biggest adversary in those days). To hammer that point home, Ryan stopped at the exit ramp as I followed him back to the freeway after lunch and gave a panhandler a fist full of dollars. He said, “God bless.” Amen!